Game Day in Ann Arbor is always an adventure! Dale & I left the house at 9AM. It rained on the way to the stadium. Dale dropped me at Michigan Stadium to get checked-in and drove to the Ann Arbor Airport where he waited until a little before the pre-game show to get in the air. I always enjoy watching fans capture the moment in pictures – making memories and I enjoy photographing them as well. All the way from Ontario Canada, members from Rick Leach Fan Club pose for a photograph outside Michigan Stadium before the September 10, 2016 military appreciation game. U of M defeated UCF 51-14. I was planning on photographing the pre-game show from the scoreboard, but didn’t want to get the cameras wet, so I went to the 6th floor media section. Well, the rain stopped about 10 minutes prior to the game, so I made my way down and through the thousands of Michigan fans just a few minutes before the show. I was hoping to get more of the city in the background, but I wasn’t high enough. As part of the pregame festivities at the September 10, 2016 Military Appreciation game, two large flags were unfurled on the field. On the scoreboard is the University of Michigan Marching Band in the “M” formation and the Sign language interpreter as the MMB plays the National Anthem. 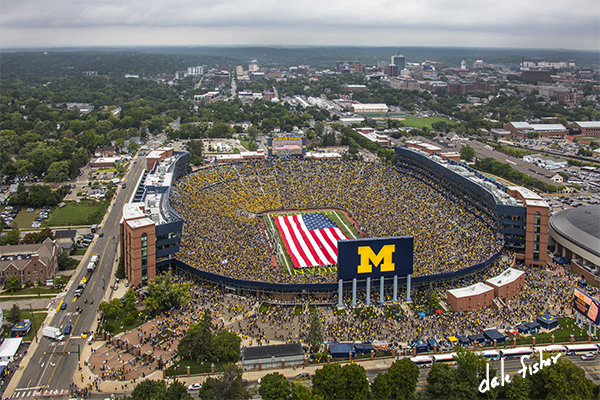 I’m certain that there is nothing in the world like this photograph that Dale took from the air; the huge flag on the field, classic view of Michigan Stadium with the campus/city of Ann Arbor in the background. 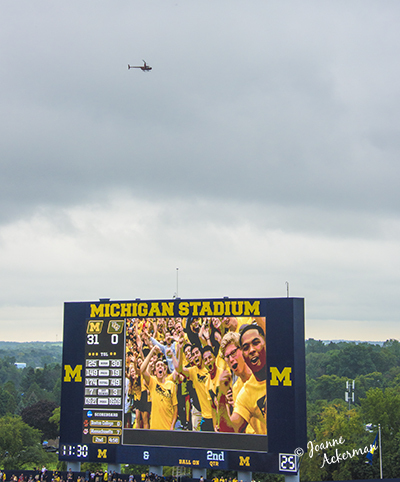 The American Flag and the University of Michigan “M” scoreboard seems to glow amongst the grey gloomy skies. 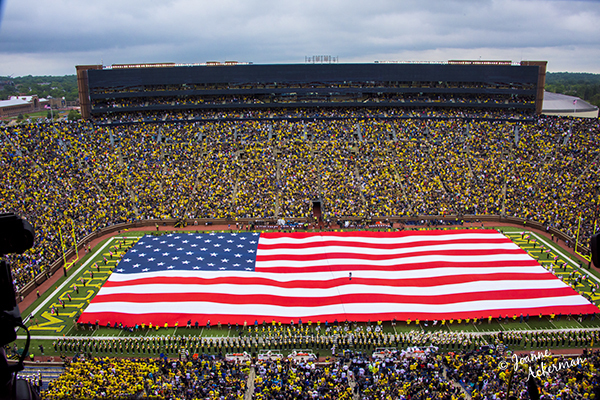 At the September 10, 2016 Military Appreciation game, the University of Michigan Marching Band half time show honored American’s Military branches, America’s heroes and remembered 9/11. A huge American Flag covered the entire field as the U of M Marching band played on the sidelines. The storms held off long enough for the U of M to defeat UCF 51 – 14. The half-time show was AMAIZING with the finale being the American Flag that filled the entire field. I have never seen such a large flag. Sure made me proud to be an American! Because of the imminent storm, the decision to proceed with the unfurling of the huge American Flag came just 5 minutes before half time. As soon as the decision was made, the skies got a little brighter, the players uniforms looked more brilliant & the colors of the American Flag seemed to shine with pride as the U of M Marching band played on the sidelines. 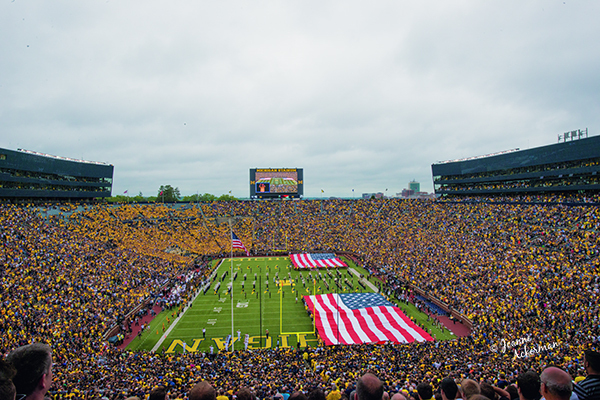 Taken from the 6th floor media section at the September 10, 2016 Military Appreciation game; the University of Michigan Marching Band half time show honored American’s Military branches, America’s heroes and remembered 9/11. 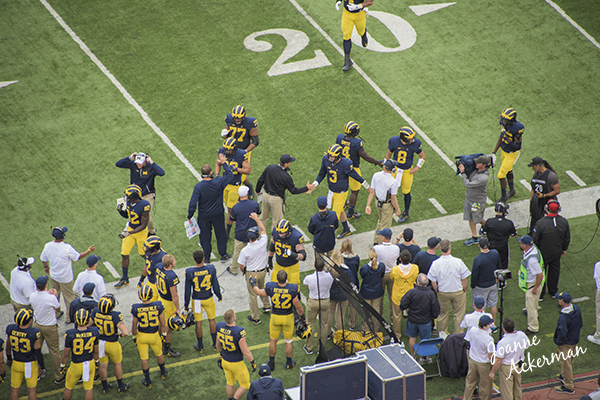 I didn’t take a lot of game photographs, but I always enjoy seeing and photographing Coach Harbaugh congratulating the players as they run off the field. Our facebook page will include more game day photos, especially some photographs of fans. 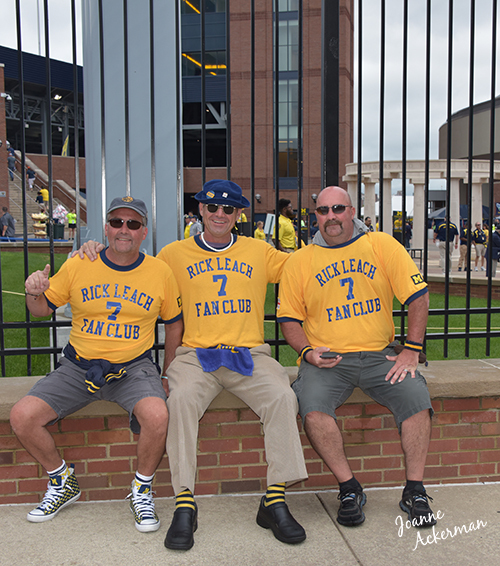 Did you happen to get the names of the fellas wearing the Rick Leach Fan Club shirts? I’m a good friend of Rick’s and I’m sure he’d like to send them an autographed picture.